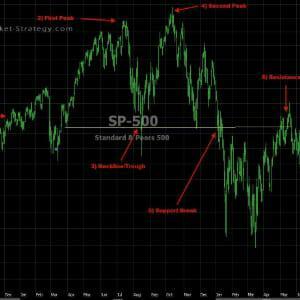 The Double Bottom is a great reversal pattern and is often showing up in a phase 1 of the market cycle. Looking to learn more about the market cycles then read my eBook on that subject. 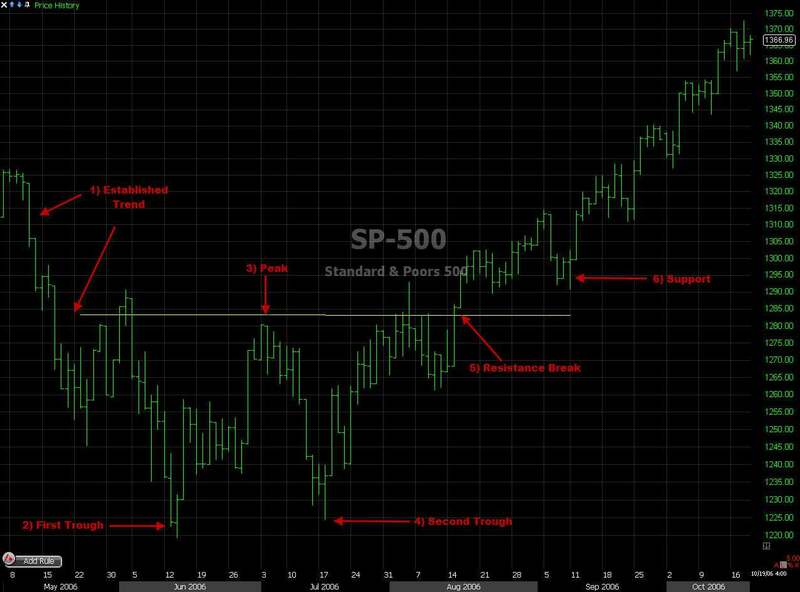 The chart pattern known as a Double Bottom is essentially a mirror image of Double Tops and they still alert us to the major factor that the price action is about to change direction (reversal pattern) but this time from a downtrend to an uptrend. Learn About One of the Most Powerful Reversal Signals! Double Bottoms are formed after an extended downtrend and price action starts to pause then trades in what we call a trading channel. The double bottom can be visualised when you analyse your chart as there are two fairly equal consecutive troughs (bottoming pricing action) and a peak in the middle. Establish Trend - As with any other reversal pattern there must be a long term established trend to reverse as Double Bottoms have to be formed after a significant Downtrend. First Trough - This trough marks the lowest point of the price action after the significant downtrend and you can occasionally see price action testing in this area before creating the neckline/peak. Peak - After the first trough has been rejected and price action starts retracing back to an area of resistance, you will sometimes see a decline in demand which is shown in the volume. Second Trough - The price action can now start to test the price of the first trough seeing that the area of resistance has now been created. 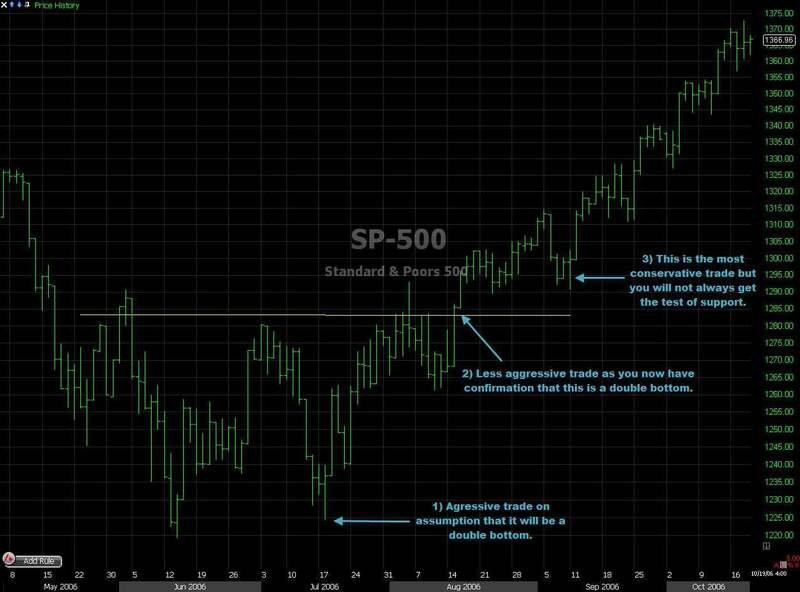 We believe here at Stock-Market-Strategy that it is down to the choice of the individual trader on what the price action should be but there are certain analysts that require price action to be within 3% either side of the first trough price. Resistance Break - As the second trough has been formed and the price has been rejected, price will advance to the resistance area of the peak. As the channel has normally been created over a 2 month period, the peaks resistance area is likely to be tested a few times before breaking. Once the resistance has been broken and the price has closed above resistance then we can be sure that the pattern is confirmed. Support - Broken resistance becomes potential support and there is a high possibility that it will be tested by the price and rejected. It is now that you should either exit all short positions from previous downtrend or enter your long position in the stock market. Aggressive - This is when the price action of the second trough reaches the price level of the first trough. This is considered a low odds trade and you will be stopped out more often. Less Aggressive - The price breaks the resistance area and closes above. There is a bigger stop loss but is more confirmation that the price is on it's way up. Might Miss - Price retests the resistance area which is now the support area. All three trading style entries have their strength and weaknesses and will come down to the trading style of the individual trader and their tolerance to money management (R&R). The Double Top is a reversal pattern meaning it is used to catch trend reversals. You will often see this chart pattern in what we call a phase 3, topping price action.